I almost immediately knew where this conversation was leading, but thought I’d wait just to be sure. “Oh, I’m their mom,” I say with a smile, gesturing in the general direction of the play structure to indicate that there is another child of mine in the vicinity. I know that nowadays families come in all sorts of mixed colors, but the general truth of darker-skinned nannies with lighter-skinned babies largely holds true at the Denver playgrounds, at least in my experience. Should I have been offended? I wasn’t, really. I have to admit to myself, though, that if the person who had mistaken me for a nanny had been a white woman, I would have been entirely offended. I’m not saying that that’s right, but it would have been true. The funny thing is, I make the exact same assumption that I don’t want people to make about me–that if I see a dark woman out with a pale baby, she must be a nanny. This won’t be the last time this happens, I’m sure. There was something else about the exchange that I found a little disturbing, to be honest. I’m old enough to be slightly flattered that she thought I was a student. What’s next? Lighting up at being carded? 🙂 Cute. For me here in DC, it’s always entertaining to guess nationalities at the playground as the place is so cosmopolitan. Yeah-see you just need to stand out more, like us. No one ever asks if I’m babysitting (ok, it did happen once, about a month after I adopted S). But mostly, everyone is politically correct and prefers to err on the other side. They frequently start with something like “your children are so beautiful” which I’ve come to view as a test, so they can establish whether or not they are mine at the beginning of the conversation. Unrelated to your experience, but puzzling none the less-I am frequently asked, usually by immigrants, where I’m from. Apparently I don’t look like an American? One of the teachers at DP asked me this when S first started there-she thought I was European but couldn’t figure out where. Must be my Canadian father’s family coming to the surface? I am a tall, blond, blue-eyed Southern white girl (with roots in Norway, Ireland, and Poland). My ex has dark hair and dark skin – his roots are Jewish Eastern European but he often gets asked if he is from Mexico or the Middle East. 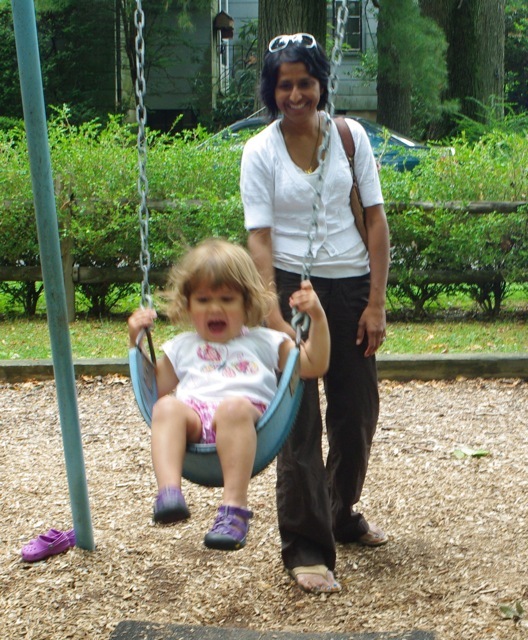 My daughter is my spitting image (yours is a little blurry in the swing but I think she looks a lot like you), but she has dark hair, dark skin, and brown eyes. I, too, have been mistaken for the babysitter. I guess that is as flattering as student – cause lot of sitters are young.